Scheduled dates are 9/23 through 10/6. The Queen’s Emissary, Petra Venj, is in the Event area straight ahead when you get to the tower. The Queen represents a new faction called simply Queen’s Wrath. Getting to level 1 will requires you to get 1000 reputation. Reputation is earned by completing bounties which are given by the Bounty Tracker. These do not replace your standard Vanguard or Crucible bounties but are represented as a new series of 5. They have the same 24 hour timer as the other bounties so you can only do 5 Queen’s Wrath bounties per day. Every time you successfully complete a bounty you will get a Queen’s Order mission reward. 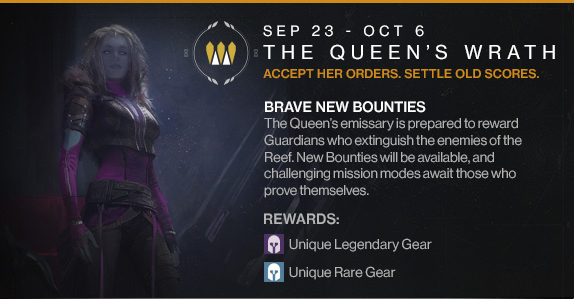 NOTE: Wearing the Queen’s Shader, Emblem and/or Class Specific Item grant bonus Faction when you turn in bounties! Each Queen’s Order Ticket allows you to do one Kill Order mission. Kill Order missions appear at the top of the line on the left side of your orbit screen when selecting a destination. These are standard missions but are rated a level 24. The easiest to do is the Earth mission Restoration. If you get a mission you don’t want to do just go to orbit. You only spend the ticket on completion. Completing these Kill Order missions awards ZERO rep but give a Queen specific Legendary Armor piece. The Tickets are turned in after winning a mission and as soon as it tells you that you have earned your Legendary you can safely go to Orbit and skip any cutscenes at the end. If you have a ticket, you get a Legendary. Anyone can join you but only players with Tickets get a Legendary. UPDATE 9/25/2014 = Patch 1.0.1.5 – Removed getting Ascendant Shards from dismantling! Even if you don’t like the gear it’s worth doing the Kill Order missions just to dismantle the Legendaries as that is guaranteed Ascendant Shards. Queen’s Guard Mask (Legendary) – 280-372 Defense, Light +18, Int +47, Str +47, Increased melee attack speed & Replenish health when you pick up an Orb. With only 2 weeks and not knowing what levels 2 and 3 are reputation wise this could be a hard faction to level up. Doing all the bounties the first day will get you to halfway to Rank 1 with 500 reputation. There are also Bounties for the first two expansions, The Dark Below & House of Wolves, so this event will come back.